Even after it was purchased by Facebook for 1 billion dollars, many businesses are still unsure of how valuable the photo-sharing social network Instagram can be in their online marketing efforts. That is quickly changing, thanks to a recent report from Simply Measured, which says that 40 percent of the world’s top-100 brands now have a presence on Instagram. These major brands taking to Instagram seems like a natural choice in a day and age when the Web is becoming increasingly social and interconnected. It’s no longer enough to just put your marketing message out there to be absorbed; these days, consumers want to connect with your brand, and photos are a great way to do that (after all, each one is worth at least a thousand words, which is a huge relief to your copywriters). 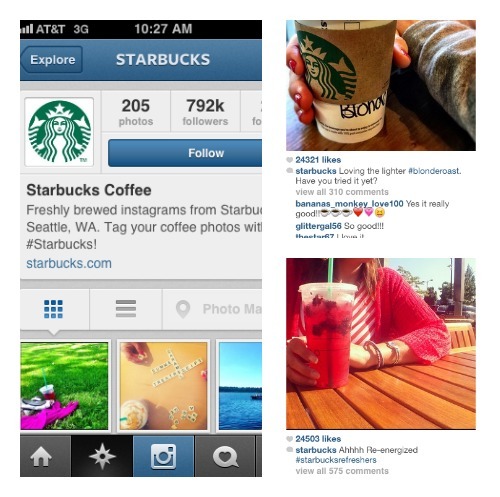 Instagram allows companies to share more of themselves with its customers than ever before. It also provides greater opportunities to extend their reach and influence across the social Web, thanks to the ability (and desire) of users to share content on and across social networks. In order to help you find sepia-filtered success with this relatively uncharted social channel, we’ve mined some of the top brands on Instagram to determine three best practice strategies, and then looked deeper into three different business sectors (retail, services and content publishing) to show you how different brands are using the service. #3 Post Engaging Content: Success with social media has always been directly related to how well you’re able to engage your followers, and it’s no different on Instagram. Actively using hashtags to tag photos is a great way to get them noticed and generate user interest, and asking questions in your photo captions can help create discussions among your followers. Also, liberally respond with @replies to foster conversations directly with users. And don’t forget to take advantage of Instagram’s ability to allow users to publish their own content and interact with your brand by uploading photos and tagging them with a unique themed hashtag. Service providers may need to plan out their strategy a little more than the aforementioned merchants, but this industry can still take full advantage of Instagram’s image-packed social network. It is important for professionals within the service industry to provide a consistent tone on Instagram, so their audience can know what kind of content to expect. 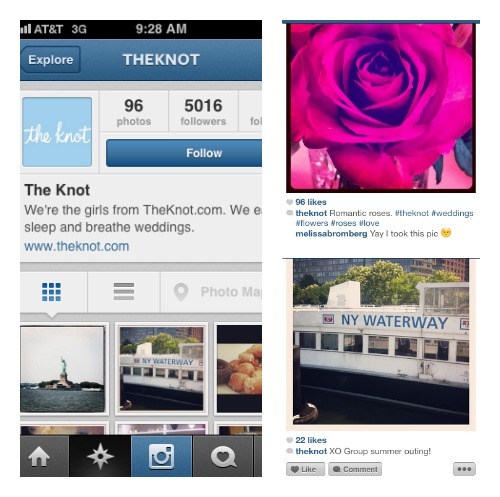 For example, The Knot’s Instagram profile not only offers wedding inspiration ideas, but also provides audience members with insight into the company’s staff. This means that brides can view floral photos for insights on bouquet arrangements, while also relating to the company’s employees by checking out a photo from the staff’s summer outing. For content producers, the biggest challenge is turning content, which many times is in the form of written articles or blog posts, into interesting and engaging images. The best way to do this is to repurpose content, especially content that is visually appealing. ESPNSports does a great job at providing interesting and relevant content to its Instagram audience. 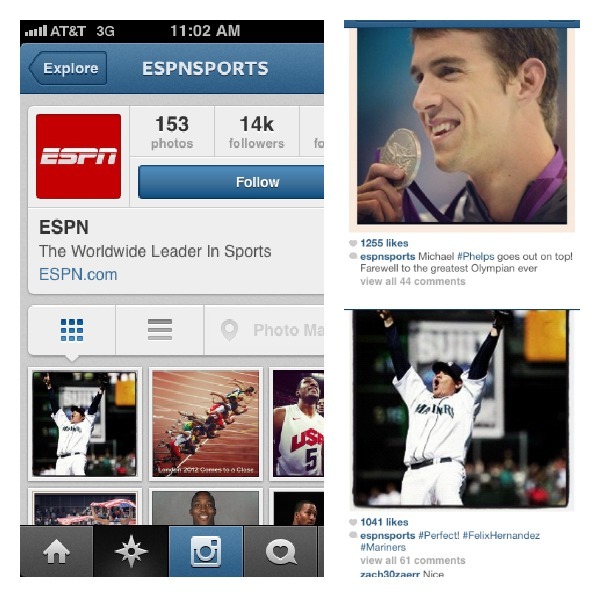 The company has taken snapshots from memorable moments in sports – such as Felix Hernandez’s recent perfect game or Michael Phelps’ Olympic accomplishments – and posts them as Instagram photos that include hashtags, as well as attract a lot of comments and likes.